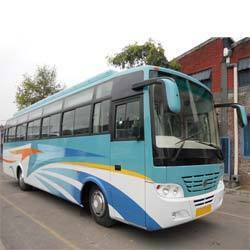 40 seater luxury coach, mercedes benz, reclining seats, hydraulic doors, climate control, 32 inches led Tv Screen, Led Floor lightening, individual lights for each seat, Audio - Video. The growing market and cater to the need of passenger vehicles for schools, colleges Govt. under taking, private transporters and other institutions. The plant is located just 2 km. from Derabassi on Chandigarh – Ambala highway and is spread over an area of eight acres. We have developed online Bus Ticket Reservation System that allows you reserve / book luxury bus ticket tickets anyplace, anytime, online. Please use the above system. We are engaged in offering our clients with rental services, we provide Luxury and deluxe coaches which are available in 28 to 49 seaters to make your journey a memorable one. Well-known for offering Car & Coach Rental Services, we are located in Kalka. We pay greater attention to the convenience and comfort of the client by offering well-maintained cars & coaches on rent with the facility of chauffeurs, air conditioners, music systems and speakers. A coach (also motor coach, often simply referred to as a bus) is a type of vehicle used for conveying passengers on excursions and on longer-distance intercity—or even international—bus service. ... The term was applied to railway carriages in the 19th century, and later to motor coaches.